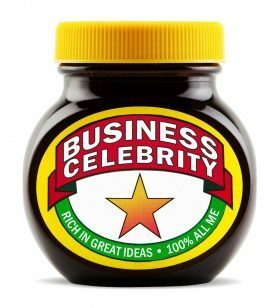 When you become a business celebrity it's important to know you turn into marmite (not literally, as that would result in quite a sticky mess!) but metaphorically - some people will love you and your Thing and others will not like it at all. It's all part of being a business celebrity; to stand out and get noticed for what you do that's different. It's a very unrealistic expectation that everyone is going to like you, so you need to be ready for that and know that it's going to happen. It happens to me all the time - when I am invited to speak on stage I expect that there will be people in the audience who will not get what I am about at all, but other people in the same room can't wait to have a chat afterwards and work with me. That's fine by me, as this means I am being clear in my message about who I am here to help (which isn't everyone). The clearer you are, and the more you stick to your Thing, the easier is for people to decide quickly if you are right for them or not. It might be what you say and how you say it that people don't like. It might be the style in which you do your Thing that just isn't everyone's cup of tea. You might go at a faster or slower pace than people like. You might explain what you do in a way that some people just don't get. That's fine. As long as YOUR ideal clients 'get' you and you are attracting those brilliant clients you want, let it go. It's not easy to be OK with people not liking you, but it is something you need to expect - in fact welcome it, as it means you are clearly standing in your spotlight and being you and being bold about it. We all need to stand out to get noticed to help as many people as we can with our Thing and sometimes this is going to make some people who hear our message tell us they don't like it. I remember a great example of this being shared with me - go a look at a famous pop star's YouTube comments (not 100% scientific but you'll get the idea). Go have a look at Lady Gaga or another 'marmite' celebrity and you'll see they'll be thousands of 'thumbs down' dislikes for that video or song... but when you compare it to the millions (or more) of 'thumbs up' likes you'll see why they need to do their Thing in spite of the people who don't like them doing it.There are WAY more people who love what they do so much they'll 'like' it, and to stop in response to the 'dislikes' would be unfair to all their fans who love what they do. There are lots of people who 'do' what you do, but only you who does it the way YOU do it, so be OK with being marmite about that, and expect that some people are going to like it and some people aren't. Now I am not suggesting you go hide behind a curtain or under your desk when a client comes near you or shut the door to your ‘shop’, but I am suggesting you are not ‘always available’. Extrovert or introvert—doing your Thing your way is always the way to go. When I talk about finding your ‘media thing’ it’s about finding the ways you love to communicate that are you sharing your message and Thing at your best. If you’re best in front of an audience go for it, but if you’re best on your own in your ‘creation cave’ go with that instead.